A spacious apartment in a multifamily house, your space includes: A flowered lined private entrance that opens into a spacious, bright, clean apartment. Enter into a sun filled room with southern exposure that looks out to the back garden. 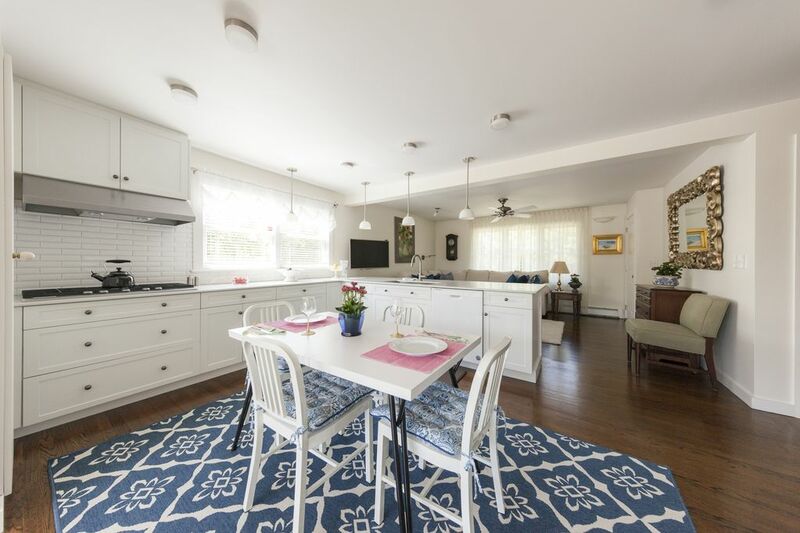 An open floor plan flows to the kitchen and dining area where you can easily prepare meals and dine looking out to hydrangeas and lush evergreens. Beyond the kitchen is a cozy living room with flat screen TV that rotates 180 degrees to the kitchen and sunroom. The king master suite is down the hall complete with large marble steam shower for romancing and love. A peaceful welcoming garden space includes cooking and seating in the sun or shade and a meandering path to a large enclosed outdoor shower for two. It is the perfect setup for luxury and relaxation. Access to large one-bedroom apartment, garden space, and driveway for parking. The home is nestled in a local community in the historic Village of Southampton. All Southampton Village restaurants, shopping, and bars are in walking distance or a 5-minute drive. Try Sant Ambroeus for coffee or 75 Main for outdoor eating. Looking for a romantic dinner? Go to Red Bar and don’t forget to try their baked Alaska. Walking distance to Jitney, LIRR, shops, restaurants, clubs, and 1.5 miles to ocean beaches. No car? No problem. LYFT is an easy and affordable way to explore the Hamptons. Use the promo code “EFFORTLESS” to get $50 in FREE rides! Before your arrival, owners contact information will be given, who occupies another suite on the property on a part-time basis. Please be aware this is a multifamily property and the owners may be in the garden. However, your space is completely private. If any personal items are left at the property, we will do our best to recover them. However, there will be an automatic charge of $30 for any items that need to be shipped back to you from your stay (prices may vary for large items).